Kate Winslet and Alan Rickman star in “A Little Chaos.” Photo Credit: Focus Features. It’s been 20 years since actor-director Alan Rickman (Lee Daniels’ The Butler, 2013), and Academy Award winner Kate Winslet (Insurgent, 2013) collaborated in Sense and Sensibility. Together again, the pair star in the romantic drama, A Little Chaos, set in seventeenth-century France. At first glance, the title alone made me think of a modern day comedy, but it’s, in fact the very opposite. It is 1682 and Sabine De Barra (Winslet), a talented landscape designer, is determined to fulfil her dream of building a big, beautiful garden one day. After an unanticipated invitation, Sabine interviews for an extraordinary opportunity to build a garden at Versailles for King Louis XIV (Rickman) – later known as garden and ballroom, Rockwork Grove. The King’s distinguished landscape artist Andre Le Notre (Matthias Schoenaerts, The Drop, 2014) is initially irritated and offended by Sabine’s out of the box, forward-thinking approach to her plan, but he quickly comes around and selects her to build the garden. Faced with class and gender barriers as well as the pressure of a timeline, Sabine recognizes that her plan is well, a little chaotic. Andre sees this too and comes to appreciate it more by the day, standing up for Sabine when the doubters challenged her. In fact, he also comes to appreciate Sabine and their romantic relationship begins to bloom. His wife, her past and the class distinction set them up against many odds, but their love for nature, gardens and each other keeps them strong. 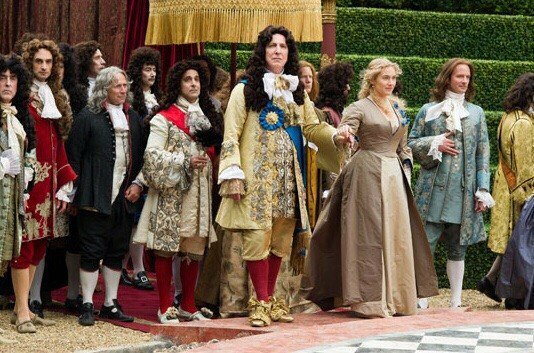 A Little Chaos is stylish, romantic, smart and entertaining for adults. The title is a little misleading, until you take a deep dive into the plot, but even then I could think of more chaotic films. The film doesn’t feel entirely authentic to the times either. Many scenes felt like a British costume film with the extravagant wigs. The plot seems to play it safe and can be predictable and silly, yet remains entertaining. I appreciated the fact that anyone can engage in this story, whether they are familiar with the time period or not. Some of what was dramatized actually happened and some of it did not, although it was hard to tell what was true and what wasn’t. The charming cast with Winslet in the lead is worth noting. Rickman is a natural as King and is generally just pretty ridiculous. Jennifer Ehle (Fifty Shades of Grey, 2015) plays Madame De Montespan who befriends Sabine despite the class differentiation. She shows a genuine interest in Sabine and her work. Helen McCrory (Penny Dreadful, 2014-2015) plays Andre’s witch of a wife and Stanley Tucci’s character (Transformers: Age of Extinction, 2014) Philippe, has no depth whatsoever, but is the main comedian of the group. According to the press notes, while the film takes place in France, it was more affordable to produce in the UK. Producer Gail Egan revealed that most of the palaces filmed in did have Louis XIV interiors: Blenheim Palace and Waddesdon Manor. Rockwork Grove is real and still stands at Versailles today – looking strikingly similar to the set. Bottom-Line? A Little Chaos is a crowd pleaser, but the seventeenth century romantic drama could dig a little deeper. Kate Winslet graces the screen as an unassuming landscape architect who astounds the big wigs (literally) by building a stunning garden ballroom at Versailles.